We enjoy eating at McDonald’s. We got very excited to hear about the special price on their hamburgers! This year marks McDonald’s Canada’s 50th anniversary and to celebrate the iconic brand is offering Canadians a special gift: 67¢ hamburgers – in recognition of its 1967 birthday. On Wednesday, August 16, 2017 from 11:00 am to 7:00 pm specially priced hamburgers will be available in McDonald’s® restaurants across the country. Over the last 50 years, McDonald’s Canada has been a place where people, families and communities have come together to share many moments. While it has already been a busy year of celebrations, with the introduction of All-Day Breakfast Selections and launch of McDelivery, this special 67¢ hamburger offer tops things off. In addition, tomorrow, McDonald’s Canada is hosting special events in three restaurants across the country to celebrate brand excitement from coast to coast. The restaurants are located in Calgary (the first restaurant in Alberta), London (the first restaurant in Eastern Canada) and Dartmouth (the first restaurant in Nova Scotia). These events will feature nostalgic decorations, classic images over the past 50 years, as well as attendance by local dignitaries and special VIPs – potentially Ronald McDonald® himself. 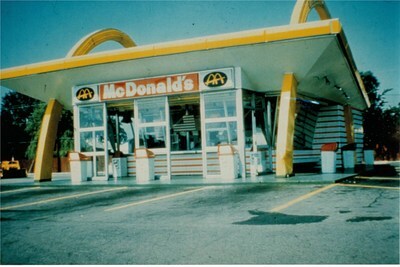 The first-ever McDonalds restaurant outside the U.S., opened in 1967, located at 7120 No. 3 Road in Richmond, B.C. McDonald’s Canada is the 2nd market to open after the U.S.
For 50 years, McDonalds has been part of the Canadian fabric. 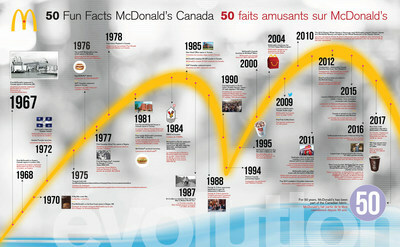 Heres a look at 50 fun facts from McDonalds Canada from 1967 through to today! « I have started to enjoying watching Tennis again because of Denis!